Here at ReviewTrackers we firmly believe that there are a number of effective strategies for managing and responding to negative reviews. Censorship is NOT one of these strategies. If only we could schedule a call with business owners who don’t seem to grasp that. Last year, a hotel in Hudson, New York attempted to charge guests $500 for every bad review. Then, just last week, a shades and blinds company here in Chicago sued a couple of review writers for libel. These attempts to stifle negative reviews have resulted in a kind of Streisand effect, prompting a number of consumers to post even more bad online reviews of the companies. 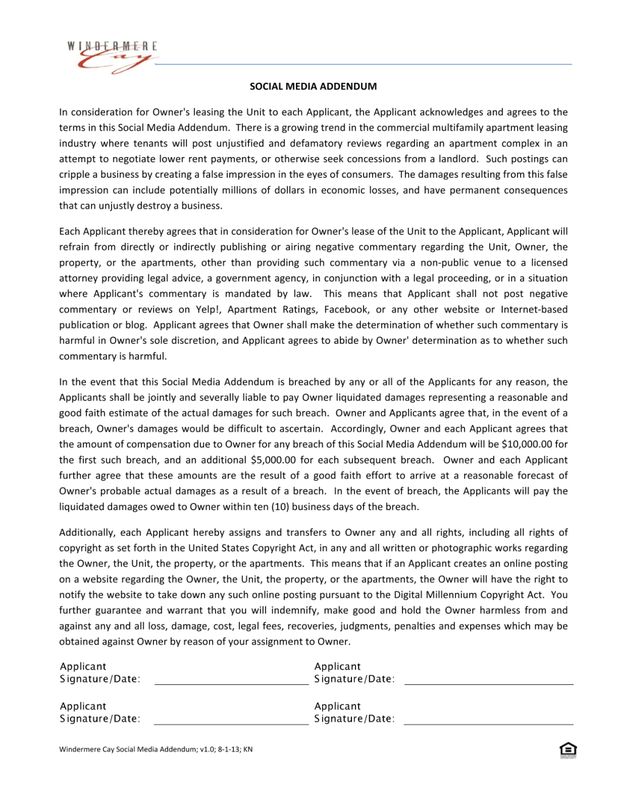 Most recently, an apartment complex in Florida called the Windmere Cay Complex was discovered to have started forcing tenants to sign a “social media addendum” to their lease application contracts, forcing them to pay a whopping $10,000 for every negative review. To no one’s surprise, Windmere Cay Complex’s Yelp page and Apartment Ratings profile have been bombarded with harsh reviews and one-star ratings, most of which weren’t even posted by tenants. The amount of negative publicity that the apartment complex has unintentionally generated is completely unnecessary. The addendum is not likely to hold up in court anyway, according to legal experts. “It would be a terrible idea to enforce this in court, a judge is going to shred it,” said Santa Clara University Law School professor Eric Goldman. Lol. Who thought this was a good idea? They’ll be lucky if this doesn’t ruin them. I’d love to see them try to actually fine someone like this. It’s a scare tactic but they’re living in an era where tactics like that just aren’t acceptable to people. Maybe $10,000 won’t be enough. This sounds like they need complete do-over. After reading such thing, who would be insane enough to stay at that place? I would pack my bags and sleep in the car instead of that. Also, just for fun I would hire some overseas persons to place some bad reviews about their complex. I hear that such service is not hard to find and also it is quite cheap as well :). The owner should try to live there for few weeks and after that sue residents if it’s such a great place to live.